Possibly the room that can accumulate most number of items in the shortest span of time is the kids’ playroom. Birthday and holiday presents, gifts from loving relatives and vacation purchases are just a few examples of events that can generate more stuff than your kids (or you!) can handle. When it comes to toys and the play room, a two-pronged approach works best to keep the mess under control. One, be ruthless in discarding broken or duplicate toys, unused and out of favor items, games with missing pieces etc. 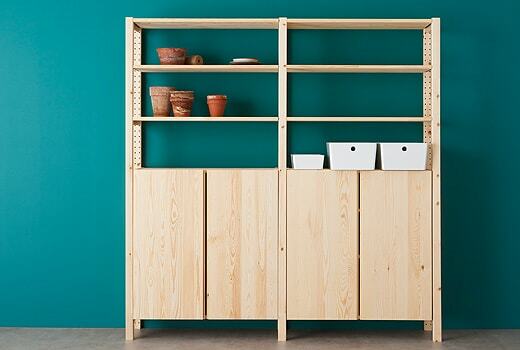 Two, create a storage system for the playroom that is both stylish and functional. An effective storage solution could be a combination of a set of drawers with varying depths, a grid of open shelves for cherished items that will be pulled out every day, and wall cabinets with doors for larger toys and games. Pieces that suit the child’s height will make them feel comfortable in the room, and be easy to reach into. Look for sturdy designs in primary colors or soft hues, safely rounded edges and corners, and doors and drawers that close gently. Another important consideration when picking storage for the playroom is that it should be flexible enough to work for the children as they grow. A changing table could convert into a play table once the baby is out of diapers, and later into a study table. The shelves of a storage cabinet can be adjusted to house toys of all sizes. Drawer and shelving units can be stacked once the child grows taller and can reach up higher. A system that works well for toys is an array of pull-out boxes or bins. Start with a basic frame with slots that can accommodate either plain shelves or roomy boxes, and add these on as and when you require. Once the primary needs are taken care of, smaller storage options like wall shelves, multi-pocket bags, lidded boxes or crates, floor baskets, wall hooks and knobs, and hanging mesh organizers can be indispensable in conquering the clutter and encouraging the kids to do the unexpected and stay organized.